He later praised his defeated opponent, Hillary Clinton, at a lobster-and-beef luncheon with congressional leaders, asking her and former President Bill Clinton to stand for applause. “I have a lot of respect for these two people,” he said.The lingering animosity from the presidential campaign was on display, too. Hillary Clinton, who won the popular vote by nearly three million but lost the presidency, was on hand for her former rival’s swearing-in at the Capitol. Obama made his exit after the ceremony, flying by helicopter to Joint Base Andrews in the Maryland suburbs, where he thanked former aides and members of his administration before boarding the presidential jet. He will return to Washington to a rental house while his daughter Sasha finishes high school, the first president to stay in the capital since Woodrow Wilson. Hours before his departure, Mr. Obama posted on Twitter to thank followers and hint that he would not fade away. “I won’t stop,” he said. “I’ll be right there with you as a citizen, inspired by your voices of truth and justice, good humor, and love.” Mr Trump, the son and grandson of immigrants who grew up to become a real estate magnate, casino owner, beauty pageant operator and reality television star whose tumultuous love life played out in the tabloids. He was also one of the wealthiest presidents ever to enter the White House. 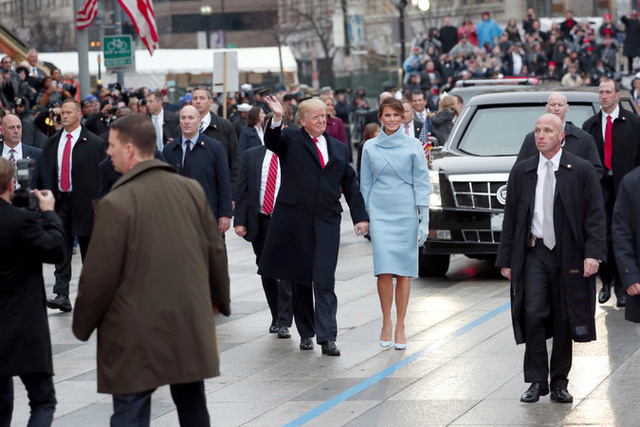 For the nation’s 58th inauguration, He and Mrs. Trump, a former model from Slovenia who became the first foreign-born first lady since John Quincy Adams’s wife, Louisa, started the day with a service at St. John’s Episcopal Church adjacent to Lafayette Square, then joined the Obamas, Bidens and Pences for coffee at the White House. From there, the two presidents shared a limousine to the Capitol, where three other presidents waited: Mr. Clinton, Jimmy Carter and George W. Bush. Former President George Bush remained hospitalized in Houston, recovering from pneumonia, but a spokesman said he watched the ceremony on television. 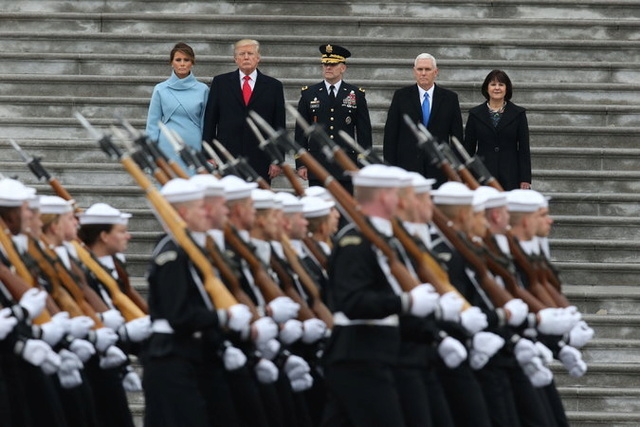 Mr. Pence, 57, was sworn in at 11:54 a.m., placing his hand on Ronald Reagan’s Bible, which was held by his wife, Karen, as their three adult children, Michael, Charlotte and Audrey, watched.For his oath, Mr. Trump placed his hand on two Bibles held by his wife, one given him by his mother in 1955 just before his ninth birthday and another used by Abraham Lincoln in 1861 and again by Mr. Obama in 2009 and 2013. Standing nearby were his adult children, Donald Jr., Eric, Ivanka and Tiffany. Also there was Barron, his 10-year-old son with the first lady. Joining them was Ivanka’s husband, Jared Kushner, who will serve as an unpaid senior adviser. Reporters at the White House to witness Mr. Trump signing his first executive order — scaling back parts of the Affordable Care Act — noticed that a bust of Sir Winston had returned to the Oval Office. The small but meaningful gesture harkens back to an Obama administration mini-drama: the Churchill bust was removed from the Oval Office and replaced with a likeness of Dr. Martin Luther King. Mr. Obama clarified last year that he wanted the King bust in the Oval Office “to remind me of all the hard work of a lot of people who would somehow allow me to have the privilege of holding this office.” But he said he also kept the Churchill bust nearby, just outside his private office in the second-floor White House residence. Days after winning the election, Mr. Trump told the British politician and Brexit champion Nigel Farage that he would bring back the Churchill bust. And so he has, the Dr. King bust also remains in place. Hours after the Senate confirmed James. N. Mattis as secretary of defense and John F. Kelly as secretary of homeland security, President Trump signed their commissions in the Oval Office. Vice President Mike Pence swore in both generals in his ceremonial office in the Eisenhower Executive Office Building, across from the West Wing. “Recognizing that no nation is secure without friends, we will work with the State Department to strengthen our alliances,” Mr. Mattis added. In tone and substance, Mr. Mattis’s short statement, like his congressional testimony last week, seemed intended to reassure partners abroad. Protesters and police officers faced off in downtown Washington just hours after Mr. Trump was sworn into office, with the sound of flash-bang grenades echoing through cordoned-off streets and the smell of tear gas wafting through the air. Minutes after being sworn in at the Capitol, Mr. Trump went to the President’s Room just off the Senate floor to sign a series of papers, including legislation cleared by Congress last week that provides a waiver for Gen. James N. Mattis from a legal requirement that military officers wait seven years before serving as defense secretary. Seated at a large table and surrounded by lawmakers from both parties, the newly minted president also signed nominations for the rest of his cabinet, joking with members of Congress as he cycled through a series of pens, one for each nominee, and asked them which ones they would like to keep. “I’ll give you Elaine — you want Elaine?” Trump asked Representative Nancy Pelosi of California, the minority leader, apparently referring to Elaine Chao, his nominee for secretary of transportation. “Are we getting some more pens back there?” he asked moments later. “This is fun.”Mr. Trump also signed a proclamation for a national day of patriotism.